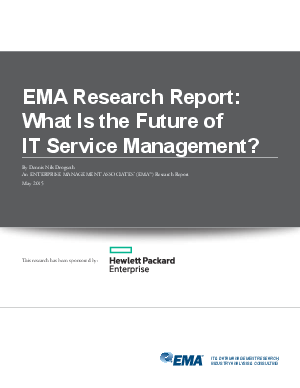 > Research Library > HP Enterprise Business > EMA Research Report: What Is the Future of IT Service Management? IT service management (ITSM) is a term that, like many terms in service management, carries with it a diverse identity—depending on whom you talk to (in role and organization) as well as on history and IT-related politics. On the one hand, ITSM is often linked to old-guard values associated with elaborate, time-consuming processes for managing change and traditional forms of governance that slow down IT resilience in the face of shifting business pressures and demands. On the other hand, ITSM is increasingly viewed as a dynamic center for expanding IT value, impact, and effectiveness in support of broader business requirements—in combination with operations, development, and business stakeholders. Can both views be right? Again, it depends on whom you ask. The data in this research rather emphatically supports the latter view—that IT service management is more needed than ever as IT seeks to become a truly service-aware, business-aligned, enterprise-facing organization. This viewpoint opposes a bastion of technologists isolated in silos who define their value almost exclusively in terms of “things” rather than the people they serve.